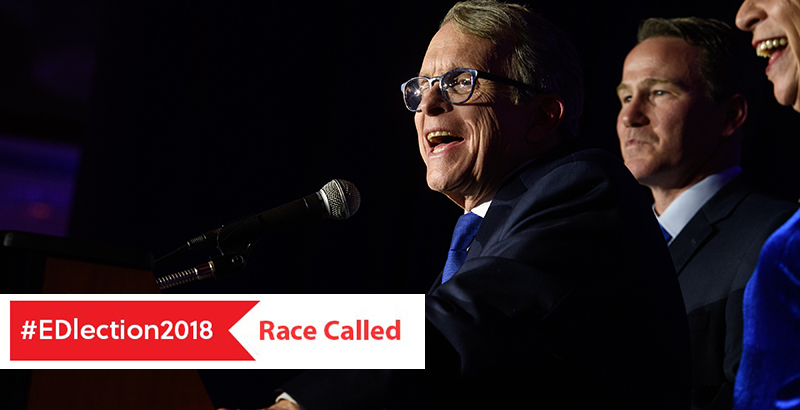 Ohio’s next governor will be Republican Mike DeWine, NBC News projected last night. The Ohio attorney general prevailed by over four percentage points against his Democratic opponent, Richard Cordray, who previously served as the state treasurer and attorney general. The race will be mourned by national Democrats, who have won just one Ohio gubernatorial contest since 1986. It also points to something of a split decision for the party in the Midwest, where they captured governorships in Michigan and Kansas, but couldn’t capitalize on opportunities in Iowa, Oklahoma, or South Dakota. In Wisconsin, one of the evening’s key races seemed to tilt toward Democrats, as conservative star and former presidential candidate Scott Walker refused to concede his bid to win a third term even as his opponent declared victory. The election was noteworthy among high-stakes governors’ races this year in that both candidates shared much in common with respect to education. DeWine and Cordray both vowed to expand eligibility for state-funded pre-K programs and pare back the number of standardized tests that Ohio students are required to take. Both also expressed concern about the state’s education funding formula, which has been repeatedly declared unconstitutional by the state’s highest court, though neither proposed scrapping it entirely. DeWine has outlined a pricey agenda on child care, beginning with greater pre-K access and including sending more mental health counselors to Ohio schools and raising the number of Ohio families that receive home visits for child development. The program would reportedly cost somewhere in the neighborhood of $200 million. Perhaps the most striking difference between the two men arose in their responses to an education crisis that unfolded earlier this year: the collapse of the Electronic Classroom of Tomorrow, or ECOT. Amid allegations of fraud, the massive online school folded in the middle of its 2017-28 school year, leaving thousands of students stranded. Cordray hit DeWine for his closeness to ECOT and its politically connected founder, William Lager, whose family donated millions of dollars to Republican candidates over past few decades. The scandal made plenty of headlines, but if the GOP brand was tarnished, no one told the voters: The party swept races for lieutenant governor, attorney general, secretary of state, treasurer, and auditor, and maintained control over both houses of the state legislature. Chad Aldis, vice president for Ohio policy at the reform-oriented Thomas B. Fordham Institute, noted that education hadn’t been a significant point of contrast between the candidates, and that DeWine would have a clear avenue to push through his agenda. Stephen Dyer, a prominent Ohio education commentator and former Democratic member of the state House of Representatives, said that he wished to work with DeWine to improve school funding and make higher education more affordable.